HP P2015dn is a great monochrome laser printer for SOHO users. The low cost printer boasts lightning fast printing speed and offers advanced features like duplexer and built-in networking. It has a compact design which makes it quite easy to place inside any small or congested office spaces. The starter pack of the printer comes with an HP P2015n printer, HP P2015n toner cartridge, and getting started guide. The printer weighs 24.3 pounds and measures 13.8 X 14.3 X 10.1 inches. It has a multipurpose tray, and extra paper trays and a built-in duplexer. The main paper tray has storage capacity of 250 sheets and the multipurpose tray can hold 50 sheets at a time. The top of the printer has plain output bin that gives the printer a stylish look. The top of the printer also contains a basic control panel that has several LED lights for function indications and one Go button for printing. The printer uses high quality HP P2015n toner cartridges and has two toner options. You can pick either the 3000-page standard toner cartridge or can go for 7000-page HP toner cartridge. The HP 2015n is good looking high speed printer that would work best for the SOHO users. 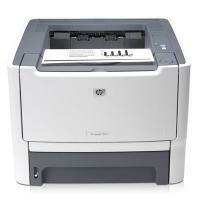 The printer boast networking feature and a compact design which make it a good pick small offices with limited spaces. The two toner options allow users to spend money according to their need and save from toner wastage. The verdict is, this is a good choice for a small printer but can be a bit expensive. Q. Can you deliver HP Laserjet P2015N toner cartridges in a day if needed? A. We are able to execute delivery of these toner cartridges in the next day in normal circumstances and the order is placed before 12 noon. Q. I’d been using HP Laserjet P2015N toner cartridge and since it was getting exhausted, I shook it a bit to make it print a few more pages. However, some toner leaked out of the cartridge in the process. Does it mean my printer is damaged? A. Toner powder tends to leak out rather easily as it’s very fine. There shouldn’t be any problem due to the toner powder leaking out; you’ll be changing the cartridge anyway so may clean the powder and use it till it lasts. Q. Do HP Laserjet P2015N toner cartridges work with HP LaserJet P2012N printer also? A. Yes, these Laserjet P2015N toner cartridges are compatible with HP LaserJet P2012N printer as also with several more. Q. The printouts I’ve been getting from my HP Laserjet P2015N printer have started looking lighter. For how long can I print with my HP Laserjet P2015N toner cartridges? A. Please change your toner cartridges right away as light print output is indicative of that. If you continue printing with these cartridges, your printer can get affected adversely and decline in performance as well. Q. Are laser toner cartridges costlier or more economical as compared to ink cartridges? And which of the two is better in quality? A. Yes, laser toner cartridges last longer than inkjet cartridges. They print much more than ink cartridges do, which turns out to be more economical while ensuring there’s no dip in quality of printouts. Likewise, laser printers are also much faster and smoother at printing, so using laser toner cartridges is certainly more beneficial in every way in the long run. Q. How status alert can be set up for the printer? A. The HP ToolboxFX can open the pop-up alerts on your computer when a certain type of event occurs. Events that trigger alerts mostly include jams, low levels of toner in HP Laserjet P2015N toner cartridges, use of the non-HP print cartridge, empty input trays, and error messages. Alerts only used to appear when the printer is printing from the computer on which you set up the alerts. Q. Does this printer support Ethernet Connectivity? A. Yes, Ethernet connectivity is supported by the HP Laserjet P2015 printer. Q. Why it is necessary to clean the printer? A. During the printing process, paper, toner, and dust particles might get accumulate inside the printer. Over time, this can cause print quality problems, such as toner specks or smearing, and paper jams. To correct and prevent such type of problems, you should clean the cartridge area and the printer media path regularly. Q. I have an HP Laserjet P2015N printer and looking for the compatible toner cartridge for my printer. Which one would you suggest? A. We would recommend you to buy the compatible HP Laserjet P2015N toner cartridge for your printer. It will offer high-quality prints and better value for money. You can find this product above on this page of the website. Q. I have recently installed the new HP Laserjet P2015N toner cartridges and got missing graphics or text, or blank pages while trying to print from the machine. What could be the reason? How can I resolve such problem? A. To resolve such issue, just make sure that your file does not contain any blank pages and that the sealing tape has been removed from the HP Laserjet P2015N toner cartridge. If it is not so, do the needful and clean the printer, particularly the contacts between the print cartridge and the power supply and try to print again.